For the settlement in the North West province of South Africa, see Slurry, North West. A slurry is a mixture of solids with specific gravity greater than 1 suspended in liquid, usually water. Most common use of slurry is as a mean of transportation of solids being the liquid a carrier that is pumped on a device like a centrifugal pump. The size of solid particles may vary from 1 micron up to hundred of milliliters. The solids may settle at certain transport velocity and the mixture can behave as Newtonian or non-Newtonian fluid. 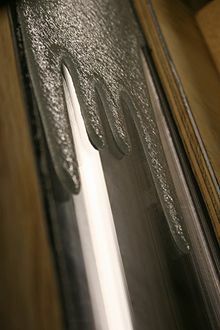 Depending on the mixture the slurry may be abrasive and corrosive. Slurry oil, the highest boiling fraction distilled from the effluent of an FCC unit in a oil refinery. It contains large amount of catalyst, in form of sediments hence the denomination of slurry. A mixture of epoxy glue and glass microspheres used as a filler compound around core materials in sandwich-structured composite airframes. even though specific gravity with units tonnes/m^3 (t/m^3) is used instead of the SI density unit, kg/m^3. 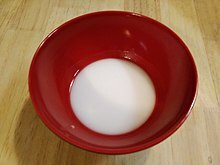 Wikimedia Commons has media related to Slurry. Look up slurry in Wiktionary, the free dictionary.